Apples are available all year, but for some reason we all seem to enjoy making apple desserts towards the beginning of fall. Juicy, hard, refreshing, crunchy, sweet, tart, and healthy apples, in so many varieties, that you can eat apples the entire day and not be bored. 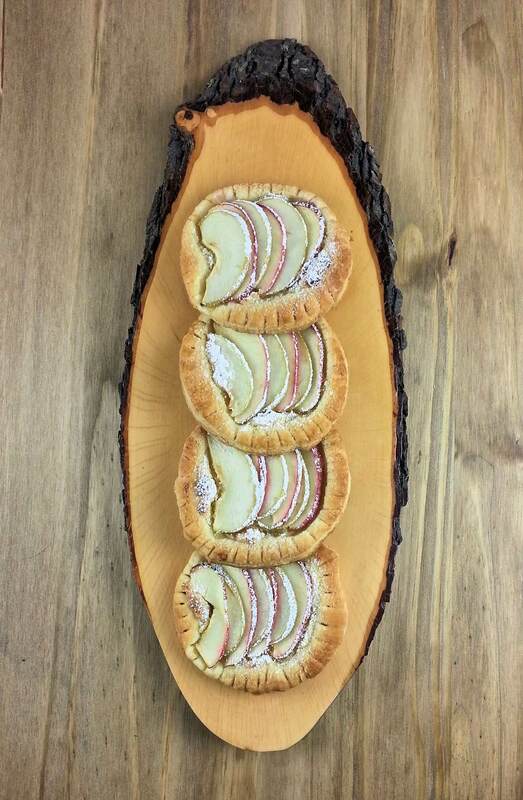 These Small Apple Tarts with Lemon Almond Paste are a quick and easy way to get an apple dessert to the table; I guess even if you only want to make one for yourself, it would not be too difficult or time consuming. We all need to treat ourselves as well. This quick ‘personal’ dessert can vary in flavor, depending on the type of apple you use, and if you have almond paste ready in your freezer, you only need to slice the apple, cut the dough and you’ll be done. Don’t get me wrong, I love apple pie, as I mentioned in an earlier post, but every now and then I like to make, serve, eat a lighter apple baking recipe and pastry dough is light. Standard pastry dough does not have much flavor, so in order to give these apple slices some life, I added a lemony almond paste. I also kept the skin on the apples, used two varieties, resulting in more color and more flavor. 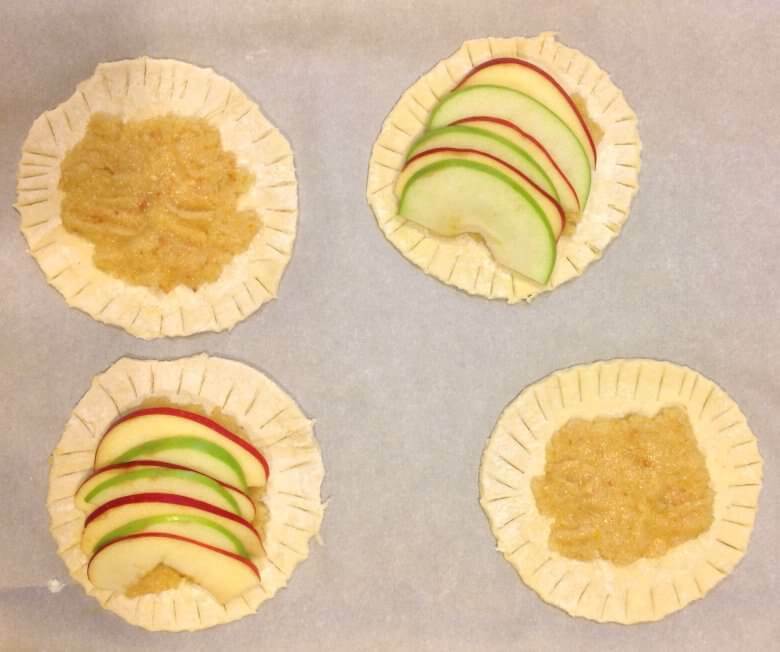 The picture below shows the Small Apple Tarts with Lemon Almond Paste raw with the almond paste and with the apples, just before the baking sheet goes in the oven. Place almonds in a food processor; cover and process until your desired smoothness. Add the sugar, egg, lemon zest and lemon juice; cover and process until smooth. I did not process is overly fine, as I like some of tiny pieces of almond; I prefer the course paste, because the nutty crunchiness adds texture. This amount of almond paste is way more than you need for 4 small apple tarts, so put the remainder in the freezer and next time you don’t need to make it. You also see that I used 2 different types of apple; Granny Smith and Gala. Small Apple Tarts with Lemon Almond Paste - A small round of pastry dough, lemony almond past, slices of apple and 15 minutes to bake. Thaw one sheet of pastry dough according to directions. Make almond paste (see directions in the post) or thaw the amount you need, from your stock in the freezer. Wash the apples, core them, quarter them and slice them (with or without skin). Cut 4 rounds out of the pastry dough sheet, using a ramekin, or a small bowl. Put a sheet of parchment paper on a baking sheet and place the 4 small dough circles on the paper. Divide the almond paste over the 4 pieces of dough, leaving 1/2 inch on the outside. Arrange the apple slices on top of the almond paste, covering it. Make small indentations in the outside circle of the dough and place the baking sheet in the oven. Bake 10 minutes, then sprinkle with powdered sugar and bake another 5 minutes. 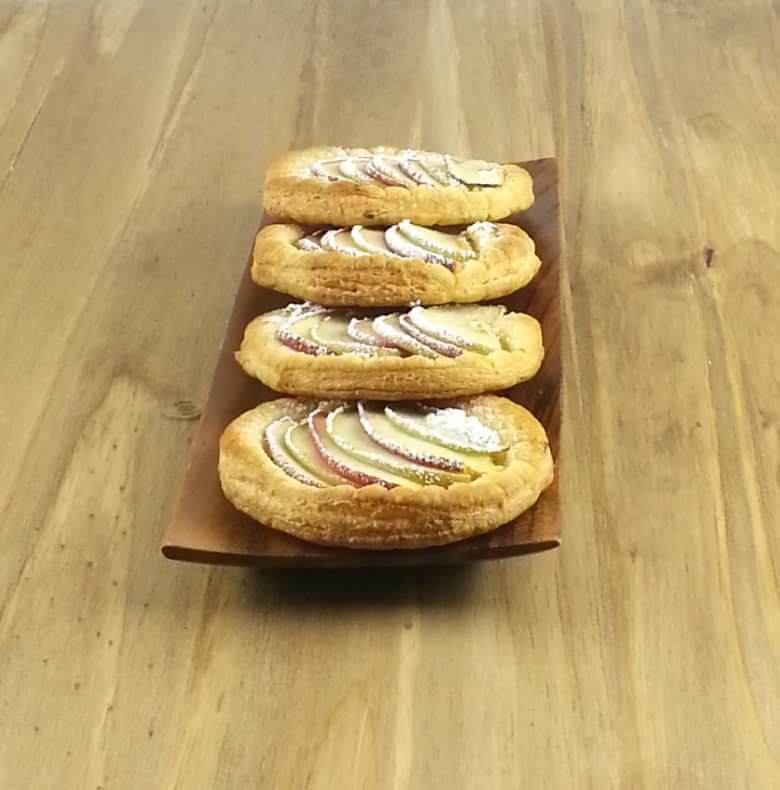 Allow the apple tarts to cool a little and serve warm or cold if you prefer.